PARLIAMENT– Members of Parliament have sought the intervention of Speaker Rebecca Kadaga after appearing in their fellow legislator Hon. Robert Kyagulanyi alias Bobi Wine’s song Tuliyambala Engule without their consent. The MPs told Hon. Kadaga that singer Bobi Wine also Kyadondo East MP, did not get their permission to include clips of them in his video. They, therefore, requested the Speaker to intervene in the matter or they go to court. “You are either an artiste or a politician. So why do you use your colleagues to do business without informing them, it’s wrong. Therefore he has to pay us because now he has used us without our consent and he is making money which is very wrong,” Moses Balyeku, Jinja West MP said. The MPs said Bobi Wine is in business and politics so he has to distinguish between the two. The MP for Lubaga South, Hon. Kato Lubwama however said the MPs in the video may have changed their minds later, because Bobi Wine seems to have talked to them prior. “I don’t buy it, that our fellow MPs are blaming their colleague. This is a small thing; they shouldn’t run to court because someone has put them in a song. He is our brother. I don’t see it as an issue,” Lubwama also an artiste said. Hon. Lubwama added that Bobi did not spoil anyone’s name but rather promoted them. “In fact, he has given them more publicity because the song has gone viral. Some of them are even just pretending but in [their] minds, they are happy to be part of the song,” he said. 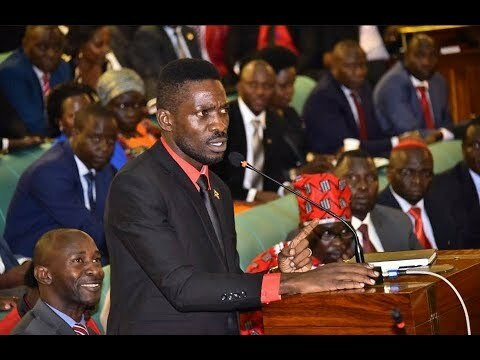 Bobi Wine defended himself on the video, saying he did not force any MP on stage while he performed at Parliament’s end of year party. “First of all, these were public photos and videos. I did not force anyone to join me, they were all happy when I sang Kyarenga and came to dance with me,” Bobi Wine said. Bobi Wine told journalists at Parliament that the NRM MPs are just threatened by the government that’s why they fear to stand on their feet to criticize the injustices in the country.